As I told you in this article, Rikomagic Company send me a few days ago a new Amlogic S912 octa core Android TV Box: RKM MK22. Here you'll find a photo gallery and a video with the unboxing of this nice device. The TV box has a black matte high quality plastic exterior case, it is pretty compact and very well organized, with and all the connectors located in the rear & right sides. In the front side it has only the IR receiver & power LED. The overall impression is pretty nice, the device looks to be constructed with care to details. Rikomagic MK22 is a perfect fully equipped Mini PC with Android Marshmallow 6.0.1 as operating system. Here you'll find the full list of tech specifications. 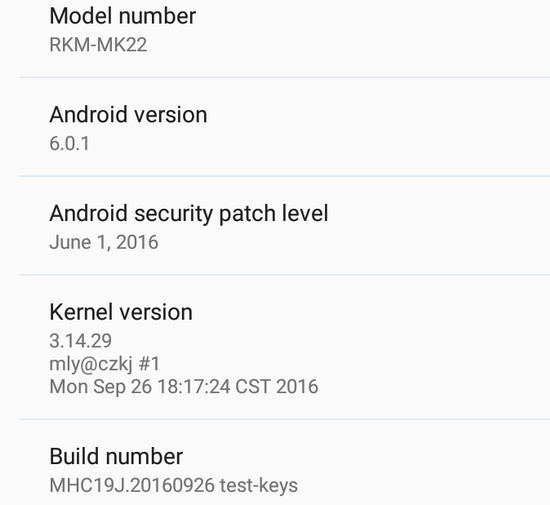 Root: Firmware is rooted, with Superuser application preinstalled and binaries already updated. Oher: The stock firmware is very smooth and I didn’t find any problem so far. Transitions, animations, apps switching and general OS fluidity is just great, I really like it a lot. During my tests, I experienced zero force closes, hangups or stability issues. 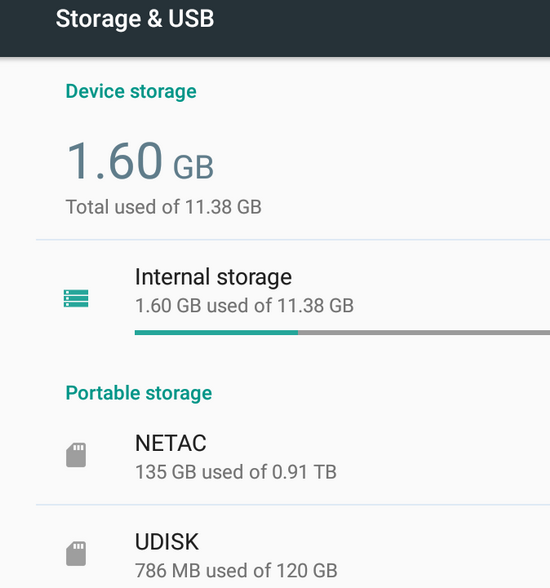 Google Play and gapps are working without issue. Google Play Services updated no problem. 3rd party apps downloaded and updated without issues. Storage. Total Capacity: 16 GB of internal Storage, Total space: 11.38 GB, available: 9.76 GB (85%). Good news again. The device sees with no problem at all my Mixza Tohaoll 128GB SDXC Micro SD Memory Card and my Netac K330 1TB External HDD USB 3.0. 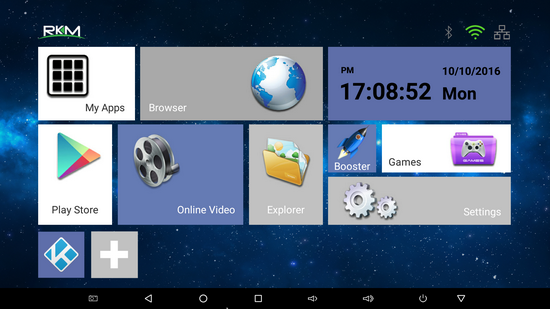 The launcher is awesome and is made by Rikomagic, with big and nice tiles, like in Windows 8.1 Metro style (RKM_launcher V3).There are a lot of preinstalled applications, including Play Store and Google applications (gapps). This firmware version has root acces. Rikomagic MK22 also supports Cast Screen, Dual band Wifi 2.4 GHz /5 GHz, Bluetooth 4.0, USB Host, DLNA and Miracast functions. In http://aziin5teens.blogspot.com /2015/04/download-antutu-video-tester-30-apk-sd.html" target="_blank">Antutu Video Tester 3.0 Rikomagic MK22 TV Box scores 861 points, a good score in this test ranking. It played smoothly almost all video file types; this firmware version fully supports 27 video & audio format files and it partially supports 3 video & audio format files (managed to play all, but not smoothly). In Antutu Benchmark 6.2.1 the device achieves also a good score, about 35.500 points. As you can see, Rikomagic MK22 TV Box is the perfect multimedia player giving you the power to transform your living room into a real 4k Home Theater. Internet speed tested on both WiFi & Ethernet gets incredible values. For 5 GHz WiFi, the download speed was 34 Mbps and the upload speed 31 Mbps. For 2.4 GHz WiFi, the download speed was 33 Mbps and the upload speed 33 Mbps. Wired, on Ethernet connection, the download speed is 48 Mbps and the upload speed is 91 Mbps. The router used in this test is Xiaomi Mi WiFi Router. - Great RKM launcher, the original UI design offers a better experience for users. About Rikomagic We were pioneers of the Android Mini PC concept and were the first Android Mini PC provider. Based in Shenzhen, China, Rikomagic aims to revolutionize the digital media player market. Our Research and Development team has extensive expertise in consumer electronics products and the development of network media players. Our core strength remains focussed around Android PCs and Android Mini PCs, where we have a great deal of experience. Rikomagic has been at the forefront of the development of multimedia, internet connected devices which truly transform TVs into home entertainment centers. The combination of our forward-looking market research, proven technological expertise and acumen, innovation, and our mature and efficient development process has given us industry-wide recognition. We differentiate ourselves by the quality, value and sophistication of our products. Our customers trust the RKM brand to enhance their entertainment experience, and we always strive to exceed their expectations.